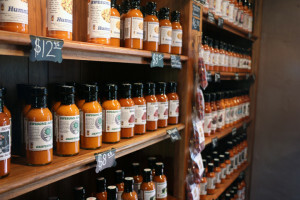 Awesome Hot Sauce features a wide selection of hot sauces, salsas, mustards, barbecue sauces, and condiments most of which are handcrafted right here in San Diego. The staff is highly trained and knowledgeable about all things spicy, so feel free to ask for assistance as you make your selections. You can sample just about anything in the store, but beware, some of these are so blazingly hot, you may need to sign a waiver before tasting them!